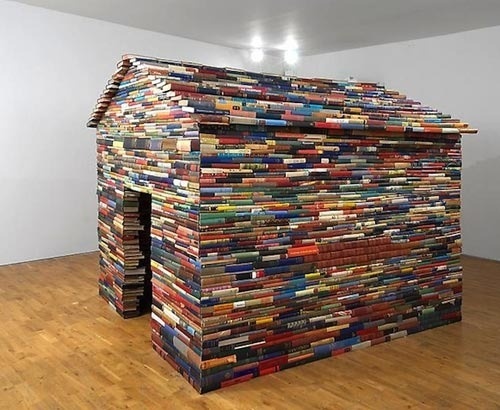 A playhouse made from old books!? HUNDREDS OF 'EM! This one really needs no explanation. With printed books, sadly, going semi-obsolete, here's one thing you can do with them- make 'em into a kids playhouse or tiny (INDOOR) house! 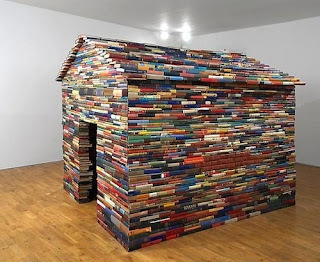 -Just make sure you have strong floor joists, as I can't imagine what this many books would weigh! I'd guess they're held together with drilled holes for rebar, or at least glued- if this were to collapse on a child, it just may ruin his/her, and YOUR, day. Here's another photo that was sent in. 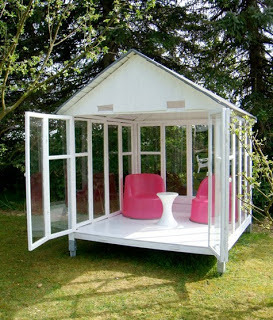 This one's kind of cool in a sparse and modern way, but it'd be hellishly hot in the summer sun. Also, if you're going to make something like this for clubhouse or kid use, don't use real glass if you can help it- its dangerous, especially when used EVERYWHERE like this structure. 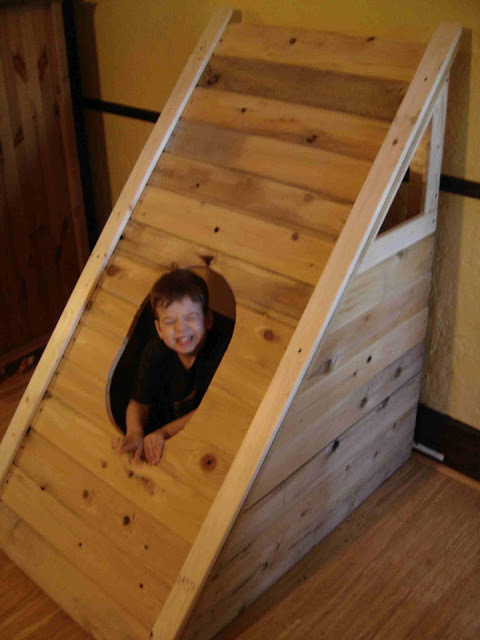 "The Wedgie" A super simple, scrap cedar fort/playhouse! 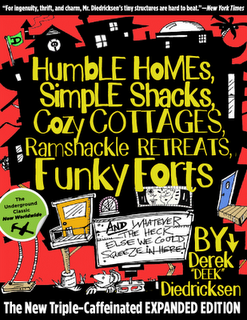 My book.... Was Amazon's #1 Kid's Fort/Idea/Carpentry book for 14 weeks! 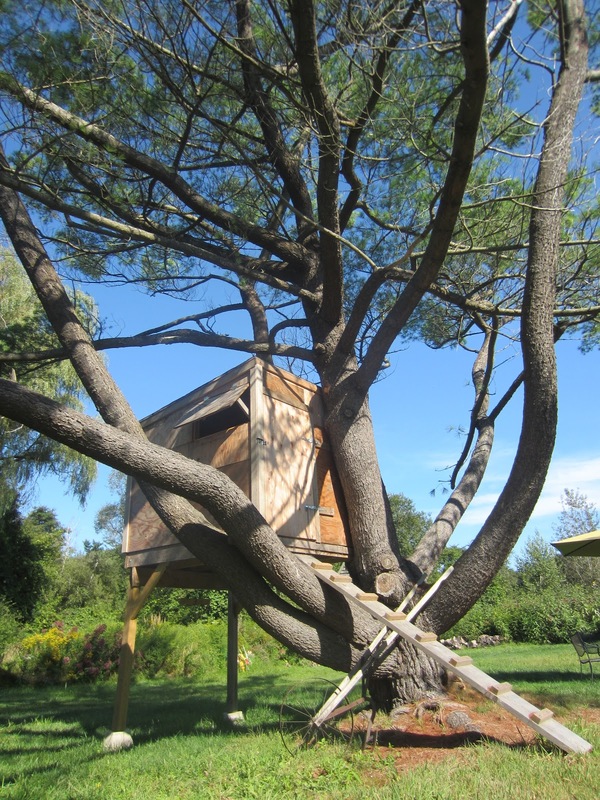 So simple- its not even painted, just bare plywood- but what a great little fort/playhouse this one is! Its in Scituate, MA, and I just happened to be driving by it one day when I had my camera. Below, it a better shot showing how great the tree and locale area- one street from a beach, and backed up to some woods/a marsh. I toured these over the past summer and have a video walk-through coming out soon on Make Magazine's site/blog- part of my "Tiny Yellow House" show on youtube that I host/produce/direct, and often film too! I'd love to see one of these as a tree house/tree fort at some point.... just built a fitting platform and raise one into place. 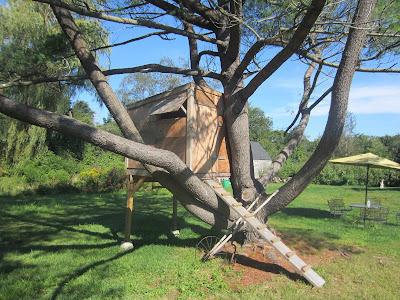 I posted on this more extensively over on my other blog www.Relaxshacks.com, as I'm pretty addicted, and involved with salvage-material building- especially when it comes to building clubhouses, tree forts, and shed offices on a budget. This is a great/simple idea (my favorite kind!) 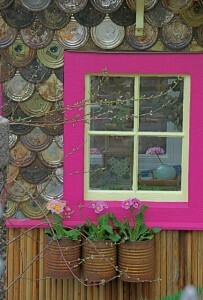 and uses saved paint can lids as effective, and decorative siding for a kid's play space. 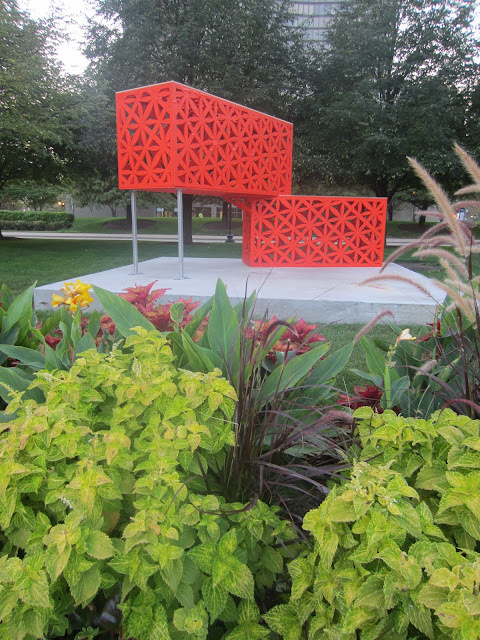 The window box is even made from re-used vegetable cans! Very clever AND fun! The brightly colored trim also adds a large whimsical and attractive element to this little shack as well! An A-frame Fishing Shack in Iceland, as a Kid's Fort? From Iceland! Its a fishing shack/hut. but if you look at the VERY simple lines and construction of it, it would make for a great budget, low-skill, kid's fort, clubhouse, shed, or even a tree house! 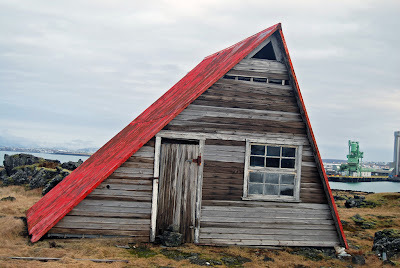 Basically its a lopsided A-frame, and while A's aren't so space efficient on the interior because of their sloping roofs, they are simple to build, and GREAT in areas with heavy snow loads. I love the look of them too! 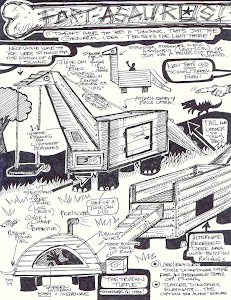 I have a few A-frame concepts in my book "Humble Homes, Simple Shacks"....including a pretty wild UPSIDE-DOWN A-frame. File under: Kid's Teepee/Wigwam. I don't know who made this, but I've seen it online a few times now. 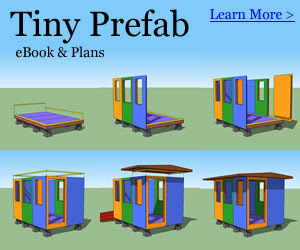 Whatever the case, its a fun little temporary fort/shelter structure for play. 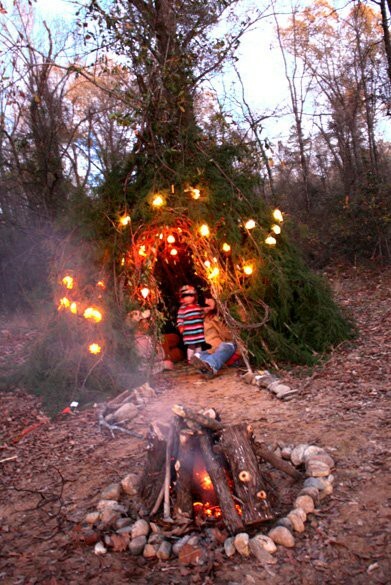 My only suggestion, I wouldn't build something like this so close to a campfire....when the thing dries out over time, and floating embers or sparks land on it- WATCH OUT! The Christmas-lights are a nice, simple, affordable, touch too, and something that every little fort or playhouse seems to benefit by- light AND decoration, all in one. Check this one out! 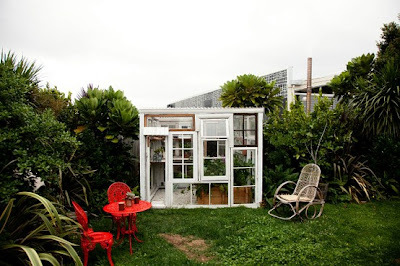 Its a playhouse, but one that can also be used as a greenhouse of "hot house" either now, or when the kids outgrow it, AND, its made from a slew of salvaged and recycled windows! ALTHOUGH- with kid's playhouses, forts, and tree houses, be careful with the use of REAL glass windows, and keep in mind that older ones may have lead paint and asbestos glazing. In many cases, if the putty work and paint is intact, a quick coat of paint or two over all will help and seal in the old paint, but still, be wary of old windows. 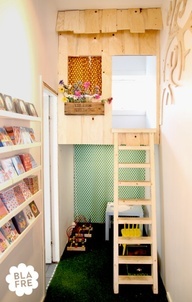 A tree house/tree fort in a bedroom hallway, or closet? 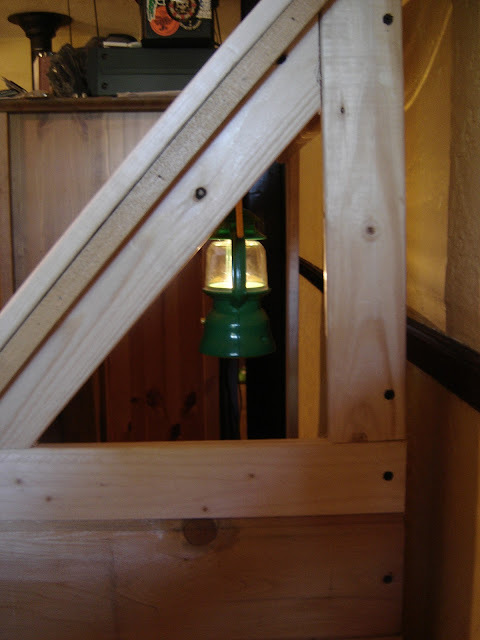 I can't really tell which, but its a great little addition to a kid's bedroom, and one that would not only be easy to build, but affordable enough. The recycled-material flowerbox outside the tree fort window is just icing on the cake. Very fun!